This is our bathroom. This is actually the only bathroom that we have in the house. Many people have looked at us like we are crazy when we tell them this, but it works for us. At least, I thought it did. 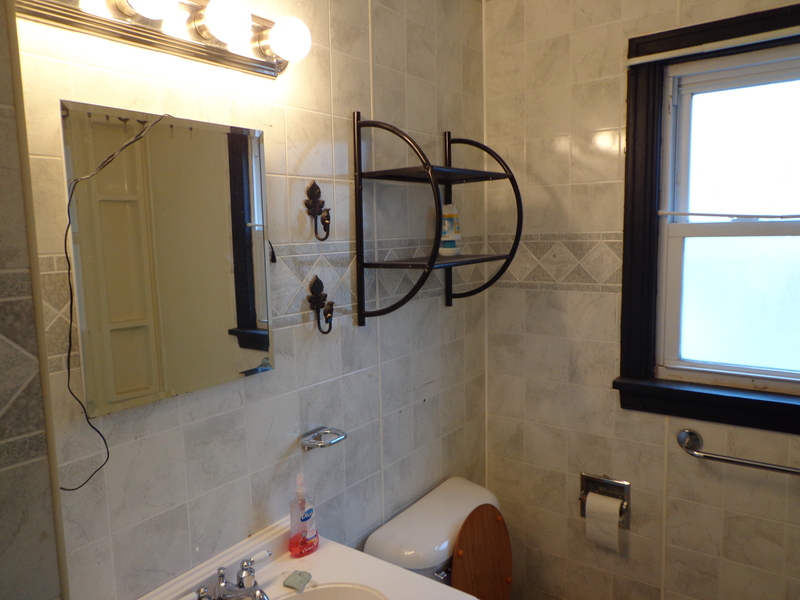 When you decide to remodel the only bathroom in your house that’s when you think that maybe another half bath would be nice. From this angle it doesn’t look too bad. The floor looks nice, the paneling is nice and shiny, and nothing seems to be too badly out of date. 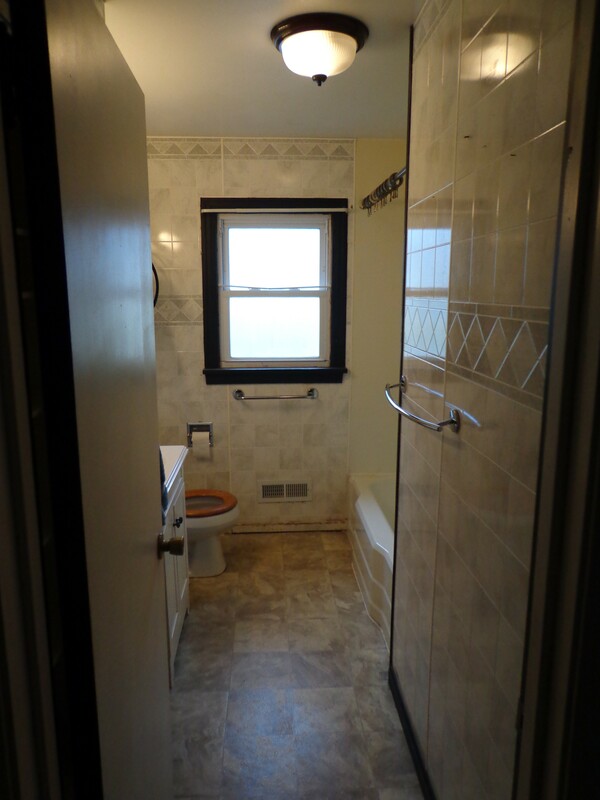 The house was built in the 1950’s so it had a cast iron tub and based on some patterns that I saw on the wall, at one time the entire bathroom had ceramic tile on the walls. 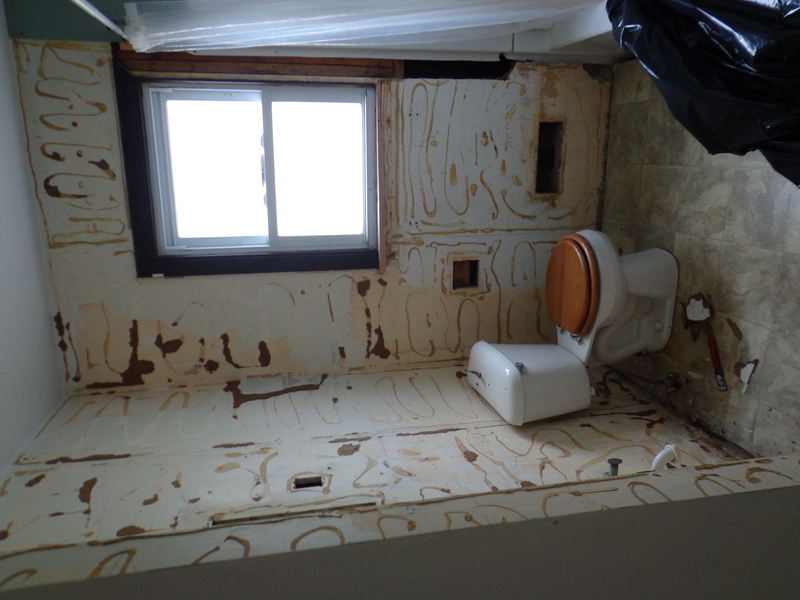 That must have gone bad because it was replaced with the paneling and this horrid tub surround. 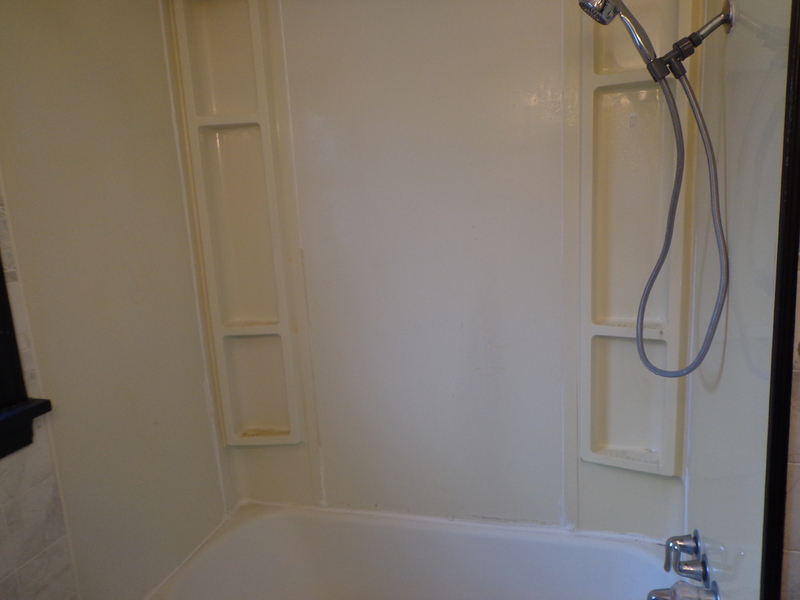 Now, this particular cast iron tub didn’t have much of a lip around the edge so if you didn’t keep a decent bead of caulk where the shower surround met the tub, you would get water dripping into the basement below. Not nice. It was so old that it was getting brittle and I was unable to clean it as I wanted. I have no idea what those black hook things were used for, except maybe decoration. And I hated that black metal shelf above the toilet. And I really hated that paneling. I’m not a fan of paneling, but especially not in the bathroom where there’s lots of moisture. Also, all of the trim is painted black and I’m not a fan of using black or gray as main colors in my home. I like the warmer browns, greens and blues. I took a few days off of work, and with my dad’s help, Jay and I took out the old cast iron tub and the brittle surround. Many people told us we wouldn’t be able to get the tub out in once piece, but as you can see we managed to do that just fine. 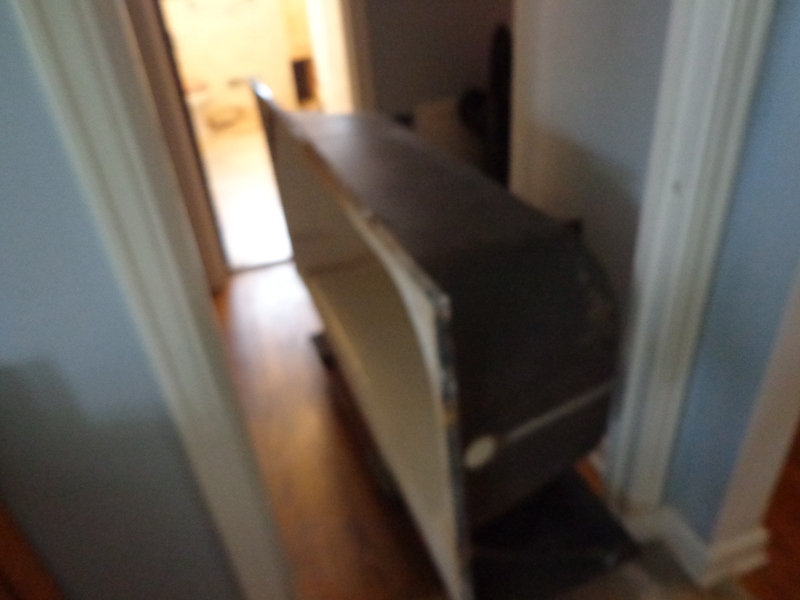 It went outside to the curb and was only out there for about 24 hours before somebody stopped and took it away. 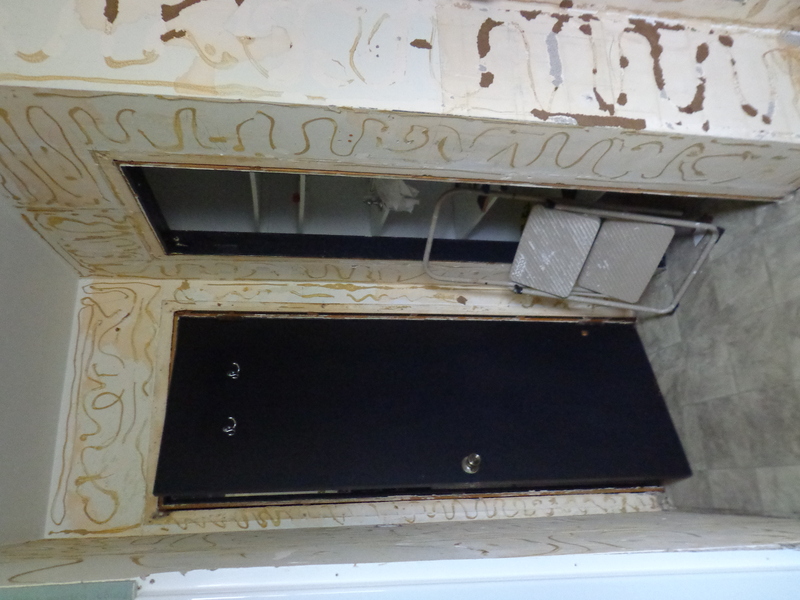 We purchased a two-piece fiberglass shower/tub unit to go back into that spot. 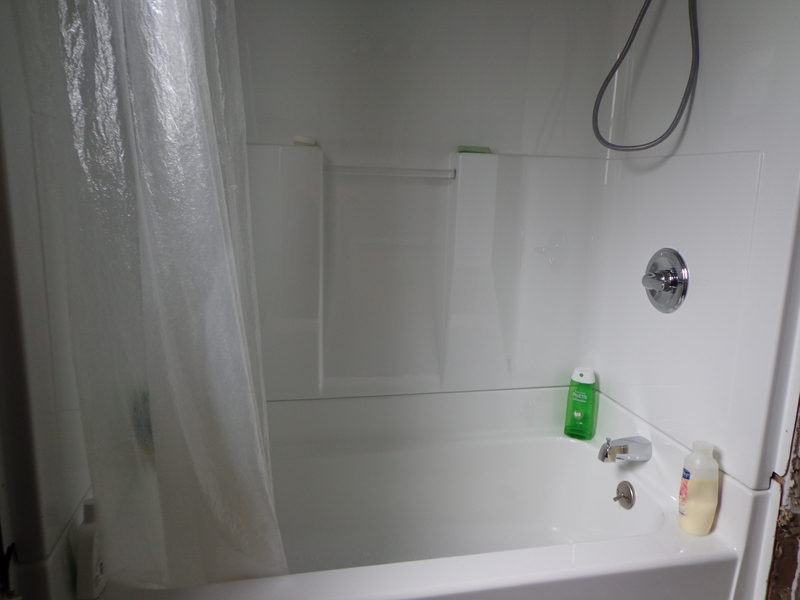 With the fiberglass I can use car wax on the walls and side of tub to help keep the tub clean. Foundry dirt has a bad habit of sticking to surfaces, so if it’s slick it will have a harder time doing so. Also, the seam where the two pieces are joined are tall enough that water should not ever be able to leak up and out of it. We had to tear out the old plaster/drywall around the tub area so that we could fit the new one into that spot. 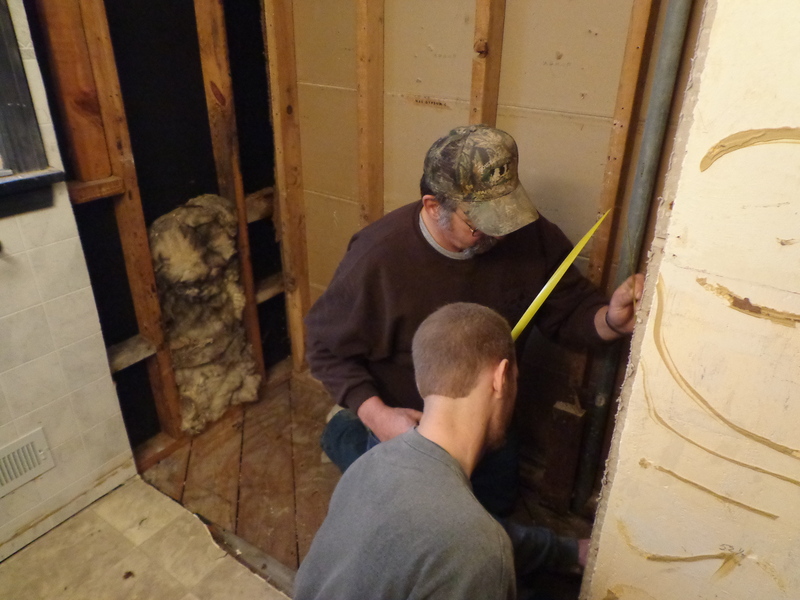 My dad and Jay then worked together to get all of the plumbing put together, soldered, and tested. And then we had a new shower!!! It’s a little narrower than the old one, but we’ll get one of those curved shower rods so that it gives a little more room when we’re in there. It’s nice just knowing that it’s a brand new unit that won’t leak into our basement. 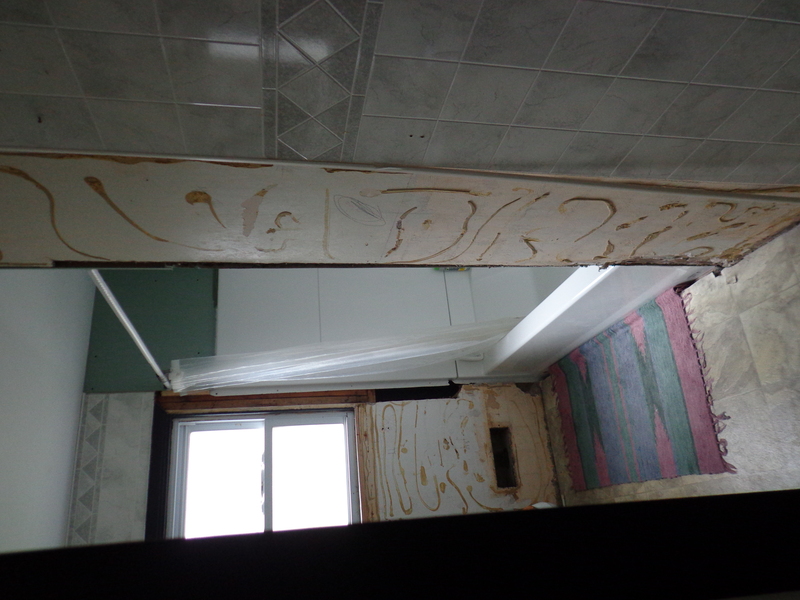 Also, it was nice to remove that old plaster because there was a slight bit of mold on it that is now out of the house. 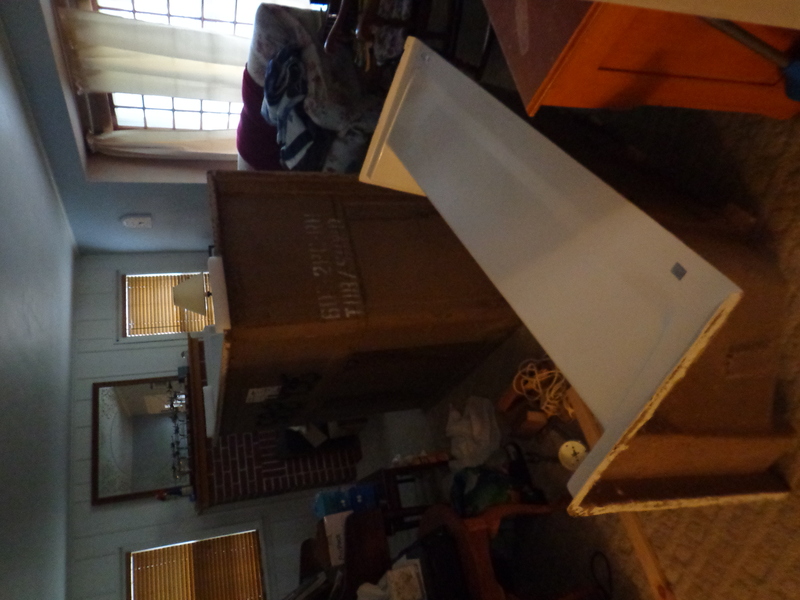 Yep… all of the paneling came down. However, they put it up with liquid nails so that was left on the wall for me to scrape off. I worked all week trying to scrape off the liquid nails. My hands got all dinged up from scraping against the plaster. However, every time I looked at it I knew that we should just tear it all down, replace it with brand new drywall, and then tear out the floor at the same time. Our bathroom floor currently is about an inch higher than the hallway floor. I think that the old subfloor had something wrong with it so instead of tearing it out and replacing it, the people simply laid a new subfloor on top of it. After so many years that has also developed some issues. Jay and I know that if we are going to do this we should do it right, but neither one of us really want to take the time that it’s going to require to rip out and replace it. We have decided to hire somebody to do this for us. They just need to get it to the point where I can paint the walls and then move everything back in. Growing up I helped my parents remodel two of the houses that we lived in. I know how to do the work, but now that I’m making decent money it’s not like I HAVE to do it myself. Life is short and our time is our own. I want to spend my time doing something that I enjoy, and fixing up old houses isn’t one of them! Once we get that done I’ll take some pictures to share.